Helm Crag is one of the best known of the minor fells, more familiar as the 'Lion and the Lamb' because of a rock formation that takes on that appearance when seen from the right location. That isn't the only rock formation on the summit - there is a second 'Lion and Lamb', while for anyone approaching from the the north the 'Howitzer' stands out. Helm Crag is actually the eastern end of the long ridge that separates Easedale and Greenburn. This ridge climbs over Gibson Knott and Calf Crag, but then rather fades away in the area between the heads of Wythburn and Far Easedale. At first glance one expects the ridge to connect with High Raise, but there is actually a line of crags and steep ground above the end of the ridge, cutting it off from the higher ground beyond. The walk along this ridge is one of my favourites, and it can be combined with a return trip along Far Easedale to make a lovely circular walk. Otherwise Helm Crag is a handy short walk, with the summit only just over a mile and a half from the centre of Ambleside on the path (1.2 miles as the crow flies). 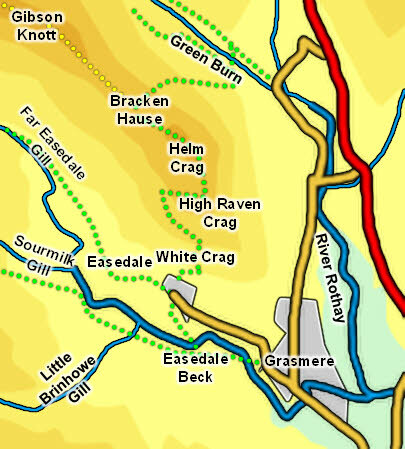 The standard route of ascent comes from Grasmere via Easedale. Towards the end of the road into Easedale a path heads up the fellside, picking its way impressively through White Crag. It then reaches a shoulder overlooking Grasmere before continuing on up a lovely ridge to the summit. Helm Crag can also be reached along the ridge from Calf Crag and Gibson Knott, or via steep paths that reach Bracken Hause, the lowest point on the ridge between Gibson Knott and Helm Crag. The ridge walk is lovely, the side paths to Bracken Hause aren't as good as the normal path. We have an ascent of Helm Crag that continues along the ridge and returns via Far Easedale. Helm Crag has a long summit with scattered rock formations. The highest point on the fell is at the top of a difficult rock (Wainwright never made it, and neither did I), but there are plenty of other rocks to explore up there. Not all of the formations that can be seen from the valley bottom are obvious on the top. Helm Crag is at the end of a ridge, with no real water courses making the end of this fell and the start of Gibson Knott. It is surrounded on three sides by streams - Green Burn in the north and Easedale Beck in the south both flow into the River Rothay, which forms the eastern boundary. There are some small becks on the lower slopes of the fell, but the only sizable one is formed close to White Crag near the main route up the fell. Helm Crag has no tarns.